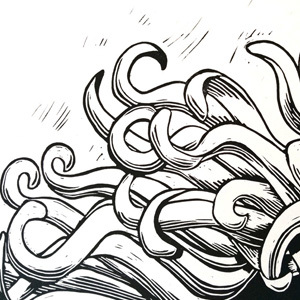 Nessy Press offers fine art linocut prints by Vanessa Sorensen. Vanessa Sorensen is a Cincinnati-based artist who is in love with curvy, organic, natural forms. She uses the age-old technique of relief printing to produce limited-edition botanical prints. Each print is meticulously produced from a hand-carved plate that is inked, burnished, and printed using oil-based ink on cotton paper. The unique prints bring beauty to any space and act as a reminder to find joy in the little things that surround us.